The outdoors are extremely dangerous for cats. Cars and predators are the main culprits that cause feline injury or death. As a result, indoor cats typically live more than three times as long as outdoor cats. Two quick catio owner stories evidence the risk of allowing cats outside. First, a few months after building our Sherman Oaks catio, my wife and I heard the catio spring door slam shut in the middle of the night. We jumped out of bed, turned on the patio lights and, to our amazement, saw two gigantic raccoons outside the enclosure. They were so big that we thought they were ROUS’s. It took some time to shoo them away with a broom. In any case, it’s true, raccoons can open doors! Thankfully the high quality spring catio doors kept these potentially vicious animals out. We have locked our catio door ever since that fateful night. 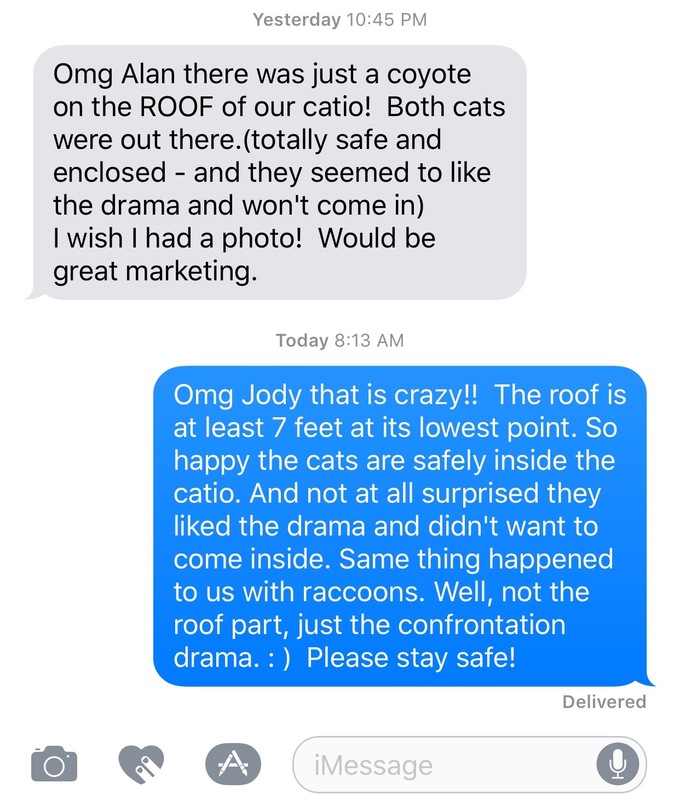 Second, about a month after we built a catio in the Palisades the owner texted me that a coyote was the roof of the catio at about 10:45pm. This comes on the heels of a coyote killing one of her cats and leaving the remains in the backyard, an incident that led to the catio construction. Thankfully, her cats were safe inside the catio and, perhaps, even enjoyed the kerfuffle. The statistics and the anecdotes all lead to one conclusion: cats should not be allowed outdoors to roam by themselves. The only legitimate question is whether to keep them indoors or provide them with a safe outdoor enclosure.